This article is about the film based on the Toei anime series. For the film called "Yu-Gi-Oh! The Movie" in English regions, see Yu-Gi-Oh! The Movie: Pyramid of Light. For other films, see Movie. Yu-Gi-Oh! (遊☆戯☆王, Yū-Gi-Ō) is a film produced by Toei Animation, based on the anime series also produced by them. A boy named Shougo Aoyama is too timid to duel, even after obtaining a powerful rare card, "Red-Eyes Black Dragon". Seto Kaiba also learns about Shougo's rare find and organizes a tournament, where attendance is mandatory for those who receive an invitation. Shougo and Yugi Mutou are later chased down and roughed up by Kaiba's henchmen from KaibaCorp, with Kaiba's henchmen overpowering both of them and stealing Yugi's Millennium Puzzle. Now Yugi must enter Kaiba's tournament and show Shougo that one can have both the potential and the power to become a true Duelist. This duel is an exhibition duel to demonstrate the rules of Duel Monsters for Miho. Summons "Winged Dragon, Guardian of the Fortress #1"
Summons "Megazowler", which attacks and destroys "Winged Dragon, Guardian of the Fortress #1". Switches "Megazowler" to Defense Position. Summons "Curse of Dragon" in Attack Position. Summons "Dark Zora" in Defense Position. "Curse of Dragon" attacks and destroys "Dark Zora". Summons "Battle Ox" in Attack Position. "Curse of Dragon" is destroyed, as its ATK was lower than the DEF of "Dark Zora". Summons "Gaia the Fierce Knight" in Attack Position. Summons "Blue-Eyes White Dragon" in Attack Position. Summons "Dark Magician" in Attack Position. Activates "Magical Hats" to cover up his monster. Sets a card, hiding it inside one of his "Magical Hats". Attacks one of the hats with "Blue-Eyes White Dragon", but he has attacked Yugi's Trap Card, "Curse of Dark Cross Star", which decreases the ATK of "Blue-Eyes White Dragon" by 700. ("Blue-Eyes White Dragon": 3000 → 2300 ATK). Summons "Celtic Guardian" in Defense Position. Activates "Monster Reborn" to revive his first "Blue-Eyes White Dragon". Activates "Wicked Chain", combining the 2 "Blue-Eyes" on the field and the 1 in his hand, which Summons "Blue-Eyes White Dragon's 3-Body Connection". Attacks "Celtic Guardian" with his "Blue-Eyes White Dragon's 3-Body Connection". Summons "Beaver Warrior" in Defense Position. Attacks "Beaver Warrior" with his "Blue-Eyes White Dragon's 3-Body Connection". Summons "Summoned Skull" in Defense Position. Attacks "Summoned Skull" with "Blue-Eyes White Dragon's 3-Body Connection". Summons "Feral Imp" in Defense Position. Attacks "Feral Imp" with "Blue-Eyes White Dragon's 3-Body Connection". Summons "Meteor Dragon" in Defense Position. Activates "Unguard" to force "Meteor Dragon" into Attack Position, but he cannot attack on the same turn he activated "Unguard". Activates "Polymerization" to fuse "Meteor Dragon" with "Red-Eyes B. Dragon" to form "Meteor B. Dragon". "Meteor B. Dragon" attacks and destroys "Blue-Eyes White Dragon's 3-Body Connection". 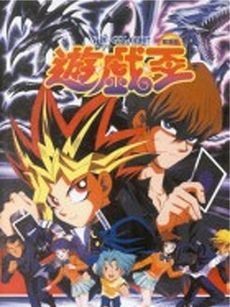 This movie is said to take place sometime after episode 3, but before the Death-T arc (starting in episode 21), as Kaiba only recalls his previous draw with Yugi. This marks the end of the Toei anime and the last appearance of Miho Nosaka. Character appearances appear closer to their manga counterparts than they did during the Toei series. Most notably, Seto Kaiba's general appearance is now very similar to his manga counterpart, his green hair and gold/light brown eyes being replaced with brown hair and light blue eyes; and Yugi Mutou/Dark Yugi's hair appears much stiffer and straighter. Also, Dinosaur Ryuzaki makes an appearance as a contestant dueling against Kaiba, but only for a brief moment while leaving the tournament due to a loss but doesn't speak. The card game is now referred to as Duel Monsters (as it is in the NAS series) and the cards' backs take on a similar appearance to their manga counterparts. Anzu has a job now despite the school laws as established in episode 2. The duel system Kaiba and Yugi use during their duel made its debut during the Duelist Kingdom story arc. The duel itself resembles the duel here in both monsters summoned and specific strategies. Blue-Eyes being summoned to destroy Gaia is identical to a turn in the duel of 1 of the NAS series and even has the same appearance from behind Yugi as it's being destroyed. The round with the Magical Hats is the same as in the duel of Episodes 9 and 10 of the NAS series. During the final turn of the duel between Yugi and Kaiba, after Yugi fuses "Meteor Dragon" with "Red Eyes B. Dragon" to form "Meteor B. Dragon" (3500/2000), Yugi somehow causes Kaiba's "Blue-Eyes White Dragon's 3-Body Connection" (4500/3000) to separate (how this happened is not explained) allowing Yugi to focus his attack on one "Blue-Eyes White Dragon" (3000/2500) which is weaker than "Meteor B. Dragon", allowing Yugi to not only destroy Kaiba's monster but cause enough Life Point damage to win him the duel. If Yugi used "Meteor B. Dragon" to attack "Blue-Eyes White Dragon's 3-Body Connection" directly, it would not have enough attack points to destroy it and instead cause Yugi to lose the duel. This page was last edited on 26 January 2019, at 09:32.